William Furlong has worked with the recorded voice since the early 1970’s, when he established Audio Arts Magazine on audiocassette. For this project, the artist presents 4 sound frames and four graphic works. He has always been fascinated with the recording process, how it can make soundings in the discourses of art, and be used to inform and disseminate creative activity. In this series of new works, Furlong abstracts words and phrases from original interviews with artists, transferring them to four ‘sound frames’. 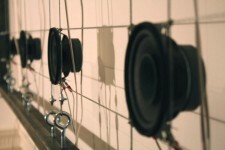 Each sound frame contains twelve loud speakers from which orchestrated and choreographed sequences of fragmented speech are interwoven and layered into rhythmic, resonant and allusive sound-scenes. On occasions, these abstract constructions imply the possibility of a conversation, but lack any ‘before and after’ narrative. The actual meanings of what is being said goes into and out of focus, like fragments of encounters barely over-heard, snatches from conversations that might have been or might still occur. FRAME 2 Why am I Making it? A new series of sound works constructed from recorded interviews made as Furlong’s participation in ‘Intelligence, New British Art 2000’, Tate Gallery. Susan Hiller, Liam Gillick, Douglas Gordon, Hilary Lloyd, Graham Gussin, Mark Lewis, Jeremy Deller & Alan Kane, Martin Creed, Yinka Shonibare, Bob & Roberta Smith, Bridget Lowe, Richard Wright, Julian Opie, Tacita Dean, Jaki Irvine, Oladélé Ajiboyé Bamgboyé, Michael Craig-Martin, Gillian Wearing, Sarah Lucas, Jeremy Deller & Alan Kane, William Furlong.